Having a newborn is never easy, the joy of a new member of your team can easily be overwhelmed by the stress of making sure your little one is getting every advantage in his or her early years. This stress is amplified in parents who don’t subscribe to the traditional nuclear family; it’s important to remember however that even if your family structure is more “modern”, there’s nothing “traditional” about proper nutrition. When I was still in the hospital setting, I saw first-hand the plight of parents who did not have access to breast milk, it directly lead to the creation of BBy. While I was still learning my trade in Chicago, I was presented with a few cases of necrotizing enterocolitis in premature and full-term infants. The one thing they had in common? They were not breastfed, all adopted by loving gay parents who wanted nothing but the best for their new children but could not give them breast milk. After seeing the absolutely harrowing sight of a child no larger than my hand wither away and die because of a disease that could have been 100% prevented with the foodstuff that nature itself provides our little ones I decided that something needed to be done. I spent a year researching every facet of breast milk, from its composition to the methods to acquire milk from other parents and one thing became abundantly clear to me; there was no unified, safe and reliable and cost-effective way for parents of all ilk to get access to natural mother's milk. Milk I purchased and had shipped to me sometimes contained viral diseases such as HIV and Hepatitis, was spoiled in transit or simply didn't arrive at all. There had to be a better way. BBy started as a community grassroots project, connect parents in our local Chicago clinics and hospitals with each other to buy and sell milk in a safe and controlled manner. Give parents desperate for mother's milk access to safe and reliable sources of the "liquid gold" and empower mothers who could provide it with a meaningful income that they could then use to raise their own children and handle the financial stresses of life. I worked night and day creating a series of tests and procedures that ensured that the milk an infant received through BBy was the same as if the mother fed the child herself. It's a safe, tested and easy method that is constantly praised by our members. By creating local communities of parents united in parenthood, we break down social, geographic and historical boundaries. BBy Parents aren't just business associates, but friends. That is all to say, that formula isn’t your only option and as we celebrate World Breastfeeding Week, we at BBy wanted to give a special nod to our LGBTQ parents. 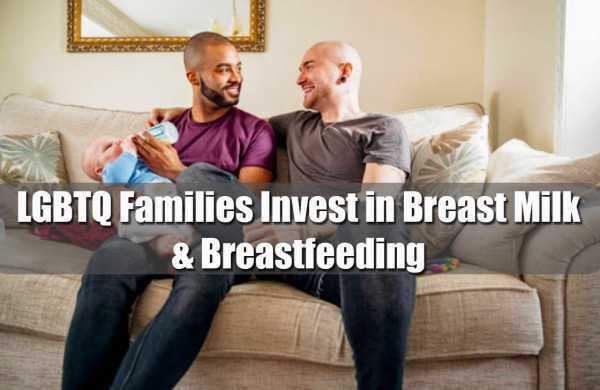 To date, BBy has helped more than 1000 infants of LGBTQ parents navigate the first year of life and set them up for a successful childhood and beyond. So I invite you to download the amazing BBy app, available for Android and iOS. I'm so excited to share our solution with you, and to continue helping care for the next generation of humans. Vansh Langer, MD is a physician from Albany, NY, and Founder and CEO of BBy, the physician created milksharing app for android and iOS that connects nursing mothers and new parents to buy and sell breast milk in a safe and reliable manner. BBy's revolutionary milk sharing is helping eliminate preventable infant mortalities and empower mothers to take control of their finances. Download the app today and learn more about milk sharing in your community.